As with most popular quotes, there’s an untold story behind it. As Anderson investigates the context and history of the “too cheap to meter” quote he is reminded that “too cheap to meter” does not mean electricity was supposed to be free. Just that the metering costs would exceed the cost of the electrons. But what if Strauss was right? At least about electricity. What if it was free? I have friends with hefty solar energy panels mounted on their roofs that in some cases is “too cheap to meter.” They have more electricity than they need on sunny days, so this excess electrical generation runs their electric meter backwards. Take that, you meter! As Anderson points out, our use of bandwidth and data storage is often on par with cheap electricity: it is simply an inexpensive utility that we don’t pay much attention to. Somedays we may even create and upload more digital bits than we download. But most of the time we are not aware of how much we pay per bit, because it is a trivial amount. And the per bit rate continues to drop, which encourages us to use more of them. Turns out that metering (measuring) electricity is way cheaper than even free electrons. All solar panels monitor and measure their free electricity. Because monitoring information is so cheap it has become cheaper and cheaper to meter until there is no reason not to meter everything. 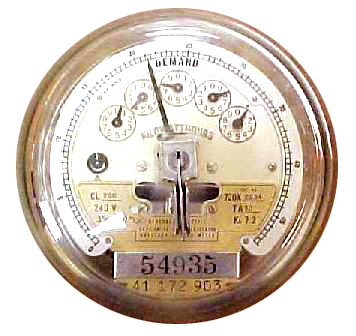 Just to be clear: the old use of the term “meter” meant both monitoring and charging. Electric companies only monitored use so they could charge. But in the new economy of abundance, monitoring use without charging for use is sufficient for extracting new value. I can get free email, free storage, free photo manipulation tools, free genealogical sharing, free phone service, free twittering, free .. well almost free anything … knowing that the hosts are monitoring (metering) my usage. Monitoring everything — all flows of materials, all flows of energy, all flows of people, all flows of attention — naturally creates rivers, if not oceans, of data about the flows of data. This flood of meta data is driven in part because the costs of bandwidth and computer cycles is itself “too cheap to meter.” But in fact, meta data is too cheap NOT to meter — if we mean only to count and monitor it. The value of measuring the meta data of any bit seems to increase as the cost of the bit decreases. At first glance there is a worry that an avalanche of data from all possible sensors, running 24/7/365 will simply drown us. What value can their be in saving every email, every web page EVER, every keystroke? One thing we’ve learned from radical self-trackers and life-bloggers is that while the value of ubiquitous monitoring seems nil at first, data streams of trivial actions are often the streams that become most valuable later on. Your night-to-night sleep patterns are worthless right now, but they might form an incredibly valuable baseline in the future if some emerging illness were to disturb them. Likewise in business, mass logs of ordinary customer behavior are now almost a hassle but might become the foundation for both new innovations and aids in discerning failures in future products and services. Imagine a world were any set of historical data was available to you. Everyone has their own favorite data stream from history they would love to have. Such a trove would transform our lives. For that reason, monitoring everything will become commonplace. Cheaply metering data, in fact, is what propels the free economy. Metering is a type of attention. Products and services will be given away in exchange for the meta data about their use. Data about the free is now more valuable than the free thing itself. Google and web 2.0 companies realize this. They meter everything they can because the data about things is more valuable than the thing itself. They buy and sell attention (a type of meta data) to the thing. One could make the argument that value derived from metering is what permits the freeconomy. Because so much is cheaply metered, we have an abundance of free. In the long run, there is nothing that cannot be made more valuable by metering it. (And in this recursive world, even metering is not too cheap to meter, so metering the meters is a good strategy as well.) We are rapidly inventing new sensors to cheaply, accurately, and continuously measure all things in all dimensions: geo-graphical location, speed, consumption, health, fitness, repairablity, connection, performance, rest, charge, and a million other vectors. The skills to parse and divine meaningful patterns out of this new environment will become paramount and eagerly sought. Those who control the gateways to this metered information will be kings. Flows of goods and services formed the basis of the first global economy. Flows of data, the second. We are headed toward an economy built on the attention to data’s data, or meta data. And there after, we’ll build on the attention to attention. In this economy the revolution will be cheaply metered. Afterall, a bit is just a difference waiting to be measured. What would be even more valuable than just creating separate datasets is an easy way to link them seamlessly together in one big data cloud. That statement alone is worth another post. There are some out there who believe the Web is in danger of creating a homogeneity of opinion (as warned in Jaron Lanier’s essay, Digital Maoism). Your statement explains very elegantly why this could never happen. It is the differences that make the information valuable, so the Web drives us to be different, not the same. If we were the same, there would be nothing to meter. Decades ago when it became clear that computational power and data storage would become incredibly cheap, I wondered if we would have all the sensors we would need to generate all the data we would like to have. The good news is that technology for sensors has been galloping along as well: accelerometers, electronic weighing, machine vision, GPS and many, many more! As fast as we develop computational power, data storage or transmission band width, it seems that we still develp ways of filling them all up. Too cheap to meter, but not too cheap to tax. I suspect solar and off-the-grid enthuiasts will be metered, anyway, and governments will add surcharges to real estate taxes in the future, based on electricity you generate for yourself. Why? Because they can. They’ll probably claim that electrical hookups to your house must be maintained; therefore, you have to pay for that, even if the power company never comes around to fix it, ever. Very inspiring essay, Professor Kelly. I’ve always wanted to be a king, and now I’ve got a DIY manual on how to go about it! I’d like a data stream of gas prices. It’s surprising hard to find. It’s interesting, though, to compare the gas price jump when Katrina hit the Gulf, and then again when Gustav hit with virtually the same track and predicted strength. Katrina: gas prices up 20% before it ever came close to NOLA, just based on shutting down the Gulf rigs. Gustav: gas prices continue to fall throughout. Then compare a third storm, Ike, which, again, was fairly similar in strength and path. Prices jumped 20% before it ever struck TX. Why the difference? It couldn’t have anything to do with how the Republicans were doing in the polls at the time, so, it’s just one of those unexplained mysteries of the universe. Eyal said “It is the differences that make the information valuable”. I think it’s more than that – that information actually is the difference. As Gregory Bateson noted: “information is a difference that makes a difference”- which is implied in Kevin’s statement that a “bit is just a difference waiting to be measured”. So meters and sensors read the “news of difference”…. but humans make it valuable (or not) by interpreting and using it in their connective and collective knowledge-formation processes. Stanley, thank you for the clarification, you are absolutely right, the difference is the information. Pardon me for asking, but you used the word connective. Did you get that from my blog, The Connective, or from somewhere else? If you’d rather email me directly, please feel free. Ron, check out Gas Buddy. You can even get similar feeds for mobile devices. just saw an interesting example of this last night watching ‘the lives of others’. all that data collected by the stasi and carefully collected in card files. most of the actual information reported probably seemed inconsequential at the time, but i can’t begin to imagine the value those entries now have for the watchees, historians, filmmakers, sociologists, etc. uses the collectors of the data could never have forseen.